The cast of Fregoli Theatre's You Could Be Us. A COMPANY called THEY run an online programme, streaming six nights a week. Subscribers gain access to Yule, Catherine, Billy, and Una, people their own age, who act out their intense, personal, miseries, so that, by comparison, the subscribers (known as ‘clickers’ ) will feel better about their own lives. Part science fiction, part black comedy, this is Jarlath Tivnan’s exciting new play, You Could Be Us, which explores themes of depression and anxiety among the young, and the personal pressures generated by social media. 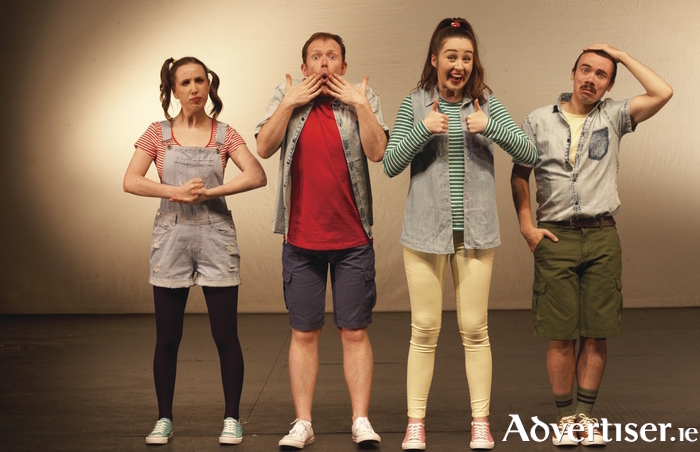 It will be staged in the Town Hall Theatre by Galway's Fregoli Theatre Company, which is also celebrating its 10th year of theatre-making. You Could Be Us follows Tivnan’s superb debut, The Pleasure Ground, which was a big hit with critics and audiences alike. It re-unites the same creative team as that production with Maria Tivnan directing a cast of Jarlath Tivnan, Kate Murray, Eilish McCarthy, and Peter Shine, and featuring original music by singer-songwriter Tracey Bruen. After rehearsal last Saturday, Jarlath Tivnan met me to talk about the play but I began by asking his thoughts on Fregoli reaching the milestone of 10 years in the business. “I wasn’t even around for all the 10 years," he admits. "It’s Maria’s child along with Tracy Bruen, Rob McFeely, and Shane McDermott who were the founders. I was still in secondary school when they formed the company in 2007; I came to NUIG in 2008 and my first Fregoli show was Breathing Water in 2010. Pleasure Ground was perhaps Fregoli’s most successful show to date. “It was absolutely terrifying the first time we did Pleasure Ground," says Tivnan. "You hear about Broadway shows where they have three weeks of previews and can stop the show if it goes wrong but when we did it in August 2015 we had an opening night and a closing night, just the two nights, so you either get it right or you don’t. It was the first play I had ever written so I was blissfully ignorant. Tivnan expands on the themes and content of You Could Be Us; “The basic idea was to look at the pressures my generation have online these days; the pressure of having to portray a particular version of yourself online that says ‘I’m interesting, I’m dynamic, I’m having a good time’. There is a constant pressure to be seen to be winning at life and that’s an engineered version of yourself you wish people to see - but I always wonder what’s going on behind people’s photo albums. Imaginative, funny and thought-provoking, You Could Be Us is set fair to add to Fregoli’s burgeoning reputation. It’s at the Town Hall for three nights only, from Monday September 11 to Wednesday 13 at 8pm nightly. Tickets are €18/15 via the Town Hall (091 - 569777 ).